Welcome to Caney Creek Beach Club completed in May of 2016. This home impresses with inviting decor and has touches of vintage beach design and unique architectural elements. This beautifully appointed home contains 4 bedrooms, 3 full baths, sleeps 11 and has an extensive open living/dining and gaming area. The home was designed and decorated with families in mind. "Memories made at the beach stay in our hearts forever." Come make some memories here on Mustang Island in Port A with your family. Caney Creek has two master suites with luxurious king-size beds and their own private bathrooms. Bedroom number three boasts a queen-size bed and a "Castro-convertible" twin bed. The fourth bedroom is a bunk room with extra-long twin beds. Each of the four bedrooms has a wall-mounted flat screened TV. The third full bath is in the hall and has a bathtub. The kitchen is well-appointed. Cooking for your crew will be an easy task. The dining and breakfast bar area provide ample seating for large families. There is a large gas grill available to grill those burgers or fresh fish. The large living room is a great place to hang out after a day at the beach. There is a custom-made ping pong table for a tournament or two during your stay. Downstairs there is a gathering area to grill and relax. Kick back and enjoy some lazy moments in the porch swings. 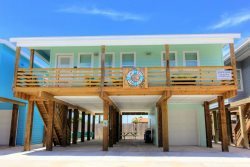 Caney Creek Beach Club in Ocean Village is a 2 minute drive to the beach. Ocean Village is located off of 11th Street and puts you just minutes to restaurants, bars, shopping, and the marina. Come experience Caney Creek Beach Club. Master Suite with king bed. TV. Private bathroom. Second Master suite with King bed. TV. Private bathroom. Ping pong table. Books. Games. Puzzles.